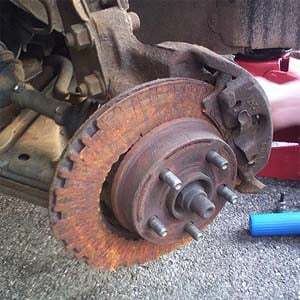 Brakes are a critical part of a car. Without them, you cannot bring your vehicle to a halt, and that could lead to accidents. A moving car without brakes is a hazard not only for the driver and passengers but also for the pedestrians that could come in the way. Therefore, it is your duty as a car owner to keep your car’s brakes in check. The good thing about brakes is that they wear out gradually and you can feel them failing. This allows you enough time to go to the mechanic and get your car fixed. If your car’s brakes are making a squeaking noise or a grinding noise every time, you apply them there is a good chance that your brake pads are going to meet their demise soon. There could be many different reasons that your brakes are making unpleasant noises. Here in this article, we will talk about some of the most common reasons that can make that happen. We mentioned this before that the principal reason that your brakes are making a squeaking noise is that your brake pads have gone bad. Brake pads are made of rubber but not the kind of rubber we usually find in our everyday life. The rubber used in brake pads is of the highest quality. They do not wear out too quickly even though they are in constant contact with their biggest enemy, friction. A brake pad has a life of about 7000 to 10,000 miles after which it has to be replaced. This depends on your style of driving. The more you use the brakes, the faster the brake pads will deteriorate. But why the squeaking noise? Well, that is caused by the brake caliper coming in contact with the disc rotor. When metal collides with metal, an unpleasant squeaky noise is created, and that is what you hear when you apply your brakes. When cars are not used for a long time, dust falls on them and this dust deposits in the most unusual of places. Your car’s brakes are one place where dust deposits the most. That is true even for those cars that are being driven daily. When you drive an unclean car and try to brake it, you will feel a squeaking noise coming from your brakes. This noise can go away once you clean your car thoroughly. Rust can happen on any metallic component if water is left on them. When you wash a car the one place that is difficult to dry is your car’s braking system. The caliper and rotor in the braking system are made of metal, and they can be exposed to rust. Once this happens, the car starts to make strange noises while the tires are running and when you try to brake. The use of oil can diminish the effects of rust but there is no permanent solution for it other than the replacement of your braking system. You may often experience a grinding noise when there is a large Rust Edge on the brake disc on the sides of the brake pads. By removing this edge, you can often solve a grinding noise problem. It is essential to keep in mind that once you go for a regular checkup of your car, you should always get genuine parts installed by your mechanic. This has to be taken seriously as low-quality components can harm your vehicles to the point where you have to spend a fortune to get them back to their original shape. Therefore, when you go to get your brake pads changed never install cheap ones as they wear out quickly and cause damage to the rotors. You should always have a keen eye out for brake pads with more metal content. Brake pads with more rubber in them last long and keep your rotors safe.
. Make sure to choose the right brake pads for your car. Rubber slips when it comes in contact with water or moisture. Which is why your car makes a squealing noise when you take it out for a drive after a night of rain. Once the humidity is rubbed off the rotors, the brakes start to become more responsive – all thanks to friction – and the noise goes away. Dew and snow can also cause the same effect on brakes, but as we learned, the sound goes away after some time, so there is nothing to worry about. However, if the noise stays, it is possible there is some other problem with the braking system. 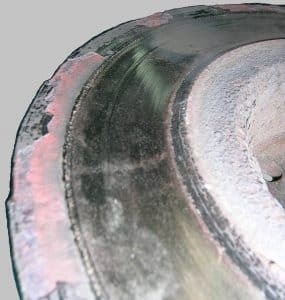 A brakes disc is made up if metal, but that does not mean that it is not prone to damage. The rotor can crack, melt or get disfigured due to friction and other factors. If that is the case, you are bound to hear grinding noises from your brake when you apply it. This is an alarming situation to be in as this means your brakes are not fit to stop your car. Fortunately, cracked discs can be spotted easily by an inexperienced driver. If you see a crack or any other irregularity in your brake’s disc, you should go straight to the mechanic and get your discs replaced. Ignoring the noise can lead to lethal accidents. A car’s brakes need regular checkups. However, there is no need to be too worried; these checkups do not need to be frequent. At least not as frequent as getting your car’s oil changed. Brakes need to be inspected once every 8000 – 10,000 miles. If there is any other problem before that time, you can go for an express visit to your mechanic to get him to take a look. Furthermore, brakes are easily repaired, and the repair does not cost too much unless you take things to the last moment, in which case you could expect a hefty bill. It is always a good idea to know why the brakes are making so much noise, as this knowledge can lead you to solve the problem at the earliest. Remember, the more you procrastinate, the more you would have to pay regarding repair costs. If you have any questions, leave a comment down below!